(Bloomberg) -- Global economic growth is being hit more significantly than many anticipate and calls for an impending U.S. recession now look increasingly credible, which is bad news for risk assets, according to Europe’s top-ranked strategy team at Societe Generale SA. The Fed’s dovish pivot should cast doubts on how the last leg of this cycle will unfold, with investors likely to see profit warnings, defaults and increased volatility over the next 12 months, they wrote in a report Thursday. That may be favorable for Treasuries but necessitates an underweight stance on equities, credit and the dollar, they concluded. 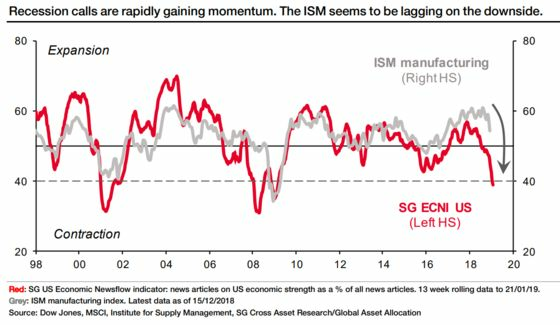 Two leading economic indicators point to slower growth for the SocGen team -- the U.S. yield curve, oft-cited as a recession predictor when it becomes inverted, and a less widely used gauge of news sentiment. This model tracks articles on economic performance as a percentage of all media stories and typically moves at least three months ahead of a corresponding shift in global industrial production data, according to the report. SocGen placed first in Europe’s Extel survey rankings for an 11th consecutive year for multi-asset research, according to its website. Riskier assets -- including stocks and high-yield bonds -- have been on a tear since late December as a more neutral stance on U.S. monetary policy dampened recession fears and raised hopes the current economic upturn will become the longest in history. Still, other indicators also show a growing risk that things could sour. 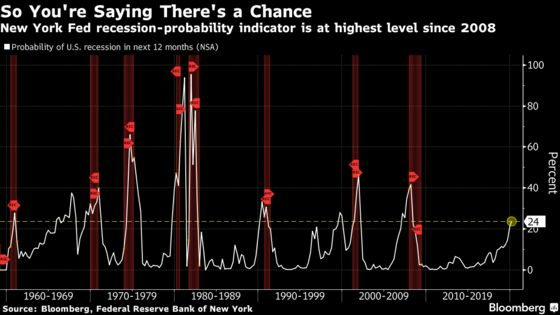 The Federal Reserve Bank of New York’s recession probability gauge, which uses the 10-year/3-month Treasury yield curve to predict the chance of a contraction in the next 12 months, recently hit its highest since 2008 -- 24 percent.